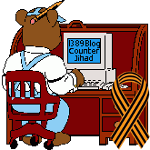 2011 April — 1389 Blog - Counterjihad! Help The NObama Sticky Note Campaign Go Viral! Gas Pump Activism: Print This Poster! Kosovo Girl Reaches Out During HOLY PASCHA!